I like March. It's an awakening of sorts. After a winter of introspection, I revert to childhood. It's time to get out and play in the water. Except of course when one fishes a spring creek. Then, it's best to stay out of the pool if possible. Winter and spring in Montana. One season morphs into the other, often with no discernible difference between the days. 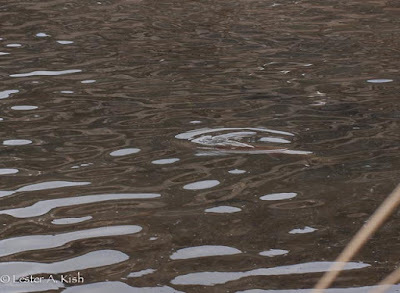 In spite of the snow, a few fish nose their way into the creek from the Yellowstone. Maybe the weeds start to grow. A little green on the stream bottom is most welcome. It's important too, bugs need something to eat, a place to hide. So do the fish. My fly rod has been strung for weeks. Once fishing starts in earnest, it stays strung. All season. After all, it's important to have a nice straight leader. There's a fly attached too. Now we know that a prudent angler doesn't tie on a fly until getting to the water. But let's face it, the process of bug elimination is a short one. There's no need for PMD's or caddis. And, beetles and hoppers needs not apply. As far as I' concerned blue winged olives are unreliable rascals. Hatches go under the file with Bigfoot sightings. Still, I've got a box full, just in case. Midges. Now they're a different story. I like 'em. Maybe it's because they like March too. They're more reliable than those blasted olives. And, one thin little fly box can hold hundreds. Naturally, I carry two. Boxes that is. Of midges. I bought a new vest a year ago, a "professional" model. It has lots of pockets. My back hurts just lifting it. All those little bottles of fly floatant add up. It must be an exponential phenomena. Each bottle, when paired with another, increases weight by a factor of four, or more. The same principle applies to bulk. Take a skinny angler, add bulky vest, and voila, said angler assumes the girth of a sumo wrestler. I think that it's time to revive the old cotton fly vest. It's lighter, has fewer pockets. How much stuff does a fisherman need to pack in order to float a few size 22 midges? A little floatant. Some 6X. No, better throw in some 7X too. Reading glasses, to see those 22's or (gasp) 24's while trying to thread 7X that I can barely feel, through the hook eye that I can barely see. That about covers it. 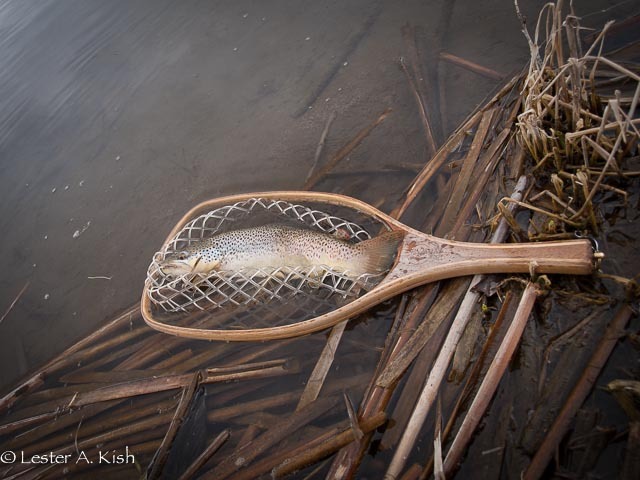 Well, every angler needs a net to scoop up that whopper. A camera too, in order to record the days events (Heaven forbid that I miss my chance at fame when Bigfoot strolls out in the latest model of form fitting waders). Suddenly I'm hauling more stuff than intended. So much for minimalism. Good thing that I picked the light vest. So what if the eight track tape player doesn't fit in it. So, back to March, and fishing. A week or so ago the midges finally showed. Not in any great numbers, but enough to get the attention of at least a few trout. I wiled away the hours pitching flies to random rises. The next few trips were more fruitful. 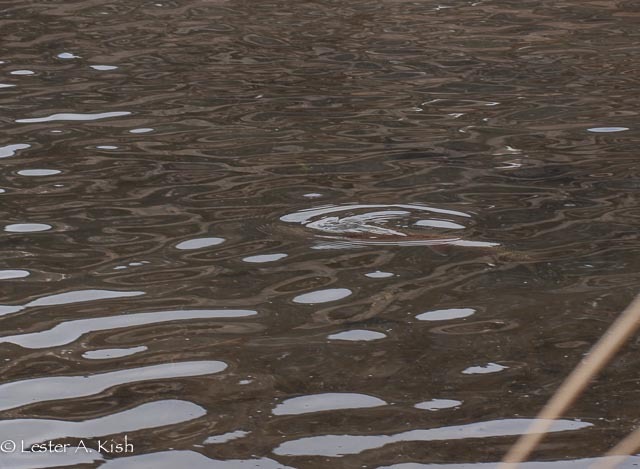 Still not many bugs, but the fish were starting to look for them. Some years the midges get going earlier. 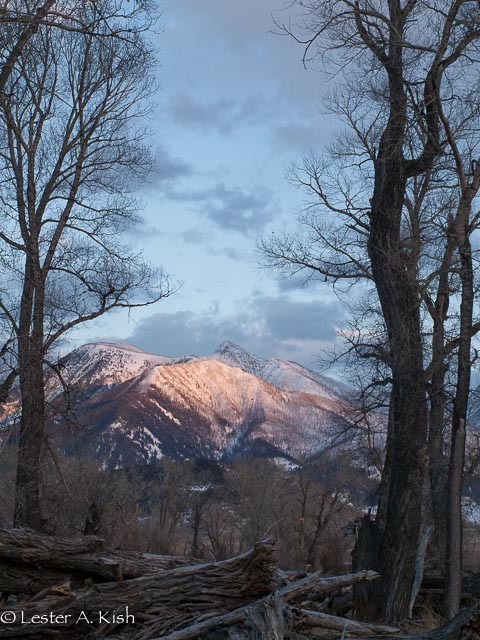 With the prolonged winter and lingering snow, this year they lagged. One afternoon, I'm on my hands and knees peering through the grass. I watch as fish circle lazily. They swim by. Close. I could poke 'em in the eye with the tip of my three weight. I watch a rainbow, he's coming my way. Gulp, gulp, gulp. His head comes out of the water. I can see his left eye. It's above the surface too. I think that this is going to be easy. Not fair at all. Just like stealing. Gulp, gulp, gulp. I keep watching. A half hour goes by. I think that maybe I should try to catch at least one. Even if it's just like stealing. First cast, fish eats. I break him off. Next cast, fish eats. I get this one, a nice brown. Then the party is over. Not fair at all was right. There's not much to eat and they get picky as hell. Random rises. Fish grab morsels while swimming this way and that. So, what's on the menu? Maybe the odd adult midge? Not many are buzzing on the surface. Pupa ready to hatch? Not many of them floating in the surface film either. Ascending pupa? There's a few, not many. It's the usual scenario. When bugs are scarce, one would think that the fish would eat every bug that they see. But no. They're increasingly fickle. They eat everything that I have, when they decide to. Infrequently, sporadically. I love this game and the way the fish play it. And so it goes. The month rounds out. A half dozen creek trips. I stay longer each time, eventually stretching the day from dawn to dark, not wanting to leave for fear that I'll miss something. Last trip, the wind subsides late in the day. At dusk I pour tea, listen to the red-winged blackbirds. A pair of owls hoot. Ding dong, March is gone. Nicely done. So it has begun! Your creek fish are fickle. My river fish are opportunistic. Your olives are iffy, mine are prompt. You got our winter, and for that I thank you. We'll both have spring, yours just shorter than mine. Its all good. While fishing now from thin boxes, I'm filling thick boxes for summer, and tying excess PMD's for the creeks. Minimal is good, but I often struggle. Its getting greener now! Glad the creeks are awakening. Yes the creeks are awakening, albeit slowly. Even slower after this mornings snowfall. A little warmth and sunshine would go a long way in improving morale. I hope to get over the hill a couple more times next week, the forecast for shirtsleeve weather doesn't look too promising though. Glad to hear that you're tying those killer PMD patterns for the summer carnage. Do you think that a couple hundred will be enough? Well, you never know . . . I guess we do know. A dozen is more than enough, but I have that fly problem. Need some different bugs in the mix too. 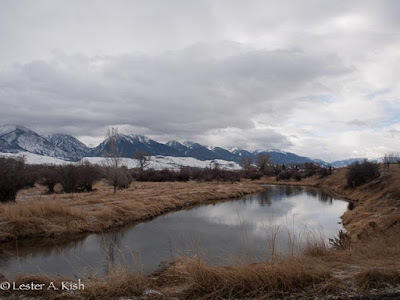 Les; Great story about March and account of Spring Creek fishing with midges. Love that last photo, and one of brown in net...sounds like you are having some nice outings. Thanks Bob. Snow yet again this morning with more to come. I hope to give it another go tomorrow if the roads are drivable. Should be another cool day regardless. Hopefully, the bugs will show. If not, I'll just add to my collection of wintry photos. Les, Are you sure you couldn't squeeze an eight-track player into the back pouch of that new vest next to the sandwiches? 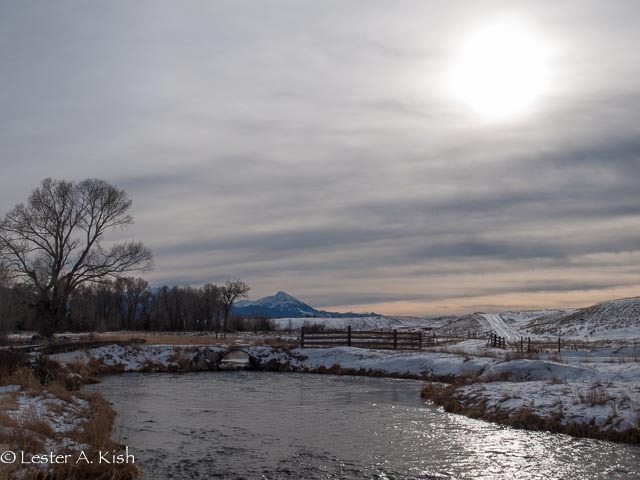 The trout might like some Music for Midge-Eaters to listen to, but really, you're doing it right, and we spring creek fishers East and West should perk up with your progress there in old MT. Walt, I carry a separate fanny pack to hold water bottles and grub in the summer, as if the loaded vest isn't enough. That way I can shed a little weight by stashing provisions in a shady spot (when I find some fish to work on). Regarding the eight track, I'm glad you noticed, few of us remember them. They sure were a big deal way back when weren't they? I have vivid memories of driving on windy roads while listening to Creedence's version of "Heard it through the grapevine". In spite of all of the alleged technological advances, I'm glad that I wasn't born later. 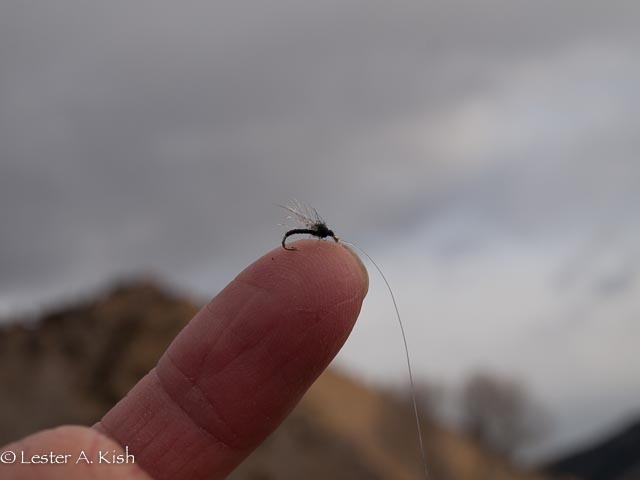 And, considering the evolution of fly fishing, tying and tackle, I still appreciate the simplicity and frustration of fishing the midge. Music for Midge-Eaters (and fishers too), I like that. I found out some years ago that traveling light and using light rods and reels were my best options when wading while fly fishing. I discarded my fishing vest five years ago when I discovered I kept putting items in all the pockets that I thought I had to fill. I also noticed as you mentioned in your post the vest got to be a pain on my shoulders. Now days I use the Fishpond lightweight chest pack packed with a tiny fly box, a couple of tippet spools, forceps, nippers pinned onto the chest pack, tiny bottle of floatant, extra leader, a few indicators and a Nature Valley Granola bar for a snake. Fishpond states in their description “Perfect for the minimalist anglers who prefer to fish and travel light”. ------------------by the way great post for all us Minimalist!!! Bill, thanks for the input. Old habits die hard, and being a child of the fifties, I can't break from the tradition of using a vest. That camera that perpetually hangs from my neck doesn't help with the bak/neck discomfort issue either. I just haven't been able to buy into the specialty fishing backpacks, chest packs or fanny packs. The fanny pack that I've settled on is a cheapo Wally World item that costs around ten bucks. Of course, as I mentioned earlier, I wear it along with the vest on summer days when I plan to be away from the vehicle for hours. The most minimal fishing that I do is while backpacking. A spool of tippet and a film canister containing a couple of flies get me through a weekend in the high country. Can't beat that.